In the 18thcentury, the transition from using human, animal, or water power to the burning of fossil fuels brought about a period of great change. This change was called the Industrial Revolution, and was built on large deposits of coal and iron that were used to fuel advances in the technologies and factories responsible for manufactured goods. What headlined this Revolution was the arrival of an improved textile industry, steam powered transportation, and mass production. What is less discussed, however, is the effect that the Industrial Revolution had on the chocolate industry. Previously, chocolate was considered in Europe and America as an exclusive drink for the elite and wealthy; either consumed in a cup at breakfast or during the day as a snack (Martin 2010). Chocolate maintained a very polarizing reputation for its multifaceted uses. Some, like Benjamin Franklin, believed that it could be used as a treatment for smallpox (Martin 2010). Others associated it with being an aphrodisiac and others believed that the “exchange of chocolates between a man and woman was tantamount to a declaration of love,” (Quélus). The reputation of chocolate and the invention of new production technologies enabled this exclusive commodity to become available to all people, leading to an increase in popularity of the product and profit from its sales. The cocoa press and the conching machine are two of the biggest innovations that empowered the chocolate industry during the Industrial Revolution. In 1828, Coenraad van Houten patented the cocoa press. This press burned coal to produce heat that would create enough steam and pressure to power the machine, which was a type of hydraulic press. This process would separate fat from roasted cacao beans, and this butter would be pulverized into a fine powder called cocoa that would later be used to create solid chocolate (Coe & Coe). The cocoa press allowed a quick, inexpensive method of creating a chocolate drink, and this invention began the process of opening the window of accessibility. The Conch Machine was the next invention to increase the accessibility of chocolate while also approving its taste and appearance. Invented in 1879 by Rodolphe Lindt, the conch was a machine that was built to give chocolate a texture that was easier to mold and preferable the solid chocolate currently in the market eaten (Giller 2017). This chocolate was described as gritty and crude, while the chocolate produced by the conch was tasty, smooth, shiny, and had a superior aroma. The original conch consisted of a granite parts that would mix ingredients from as little as six to eighty hours at a time. Secrets of the conch were so sought after that many manufacturers like Lindt either kept their methods a secret or to claimed the details of the process were “proprietary” (McClements 654). The final innovation that truly transformed the chocolate industry was the use of the assembly line. 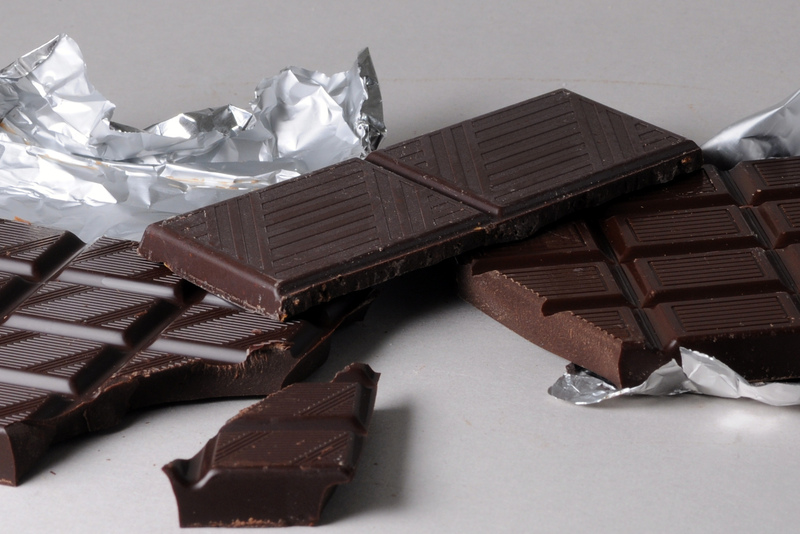 The video above shows how manufacturers specialized the production of chocolate. While some workers, like Lucy and Ethel, wrap the chocolates, other workers further down the assembly line will package the wrapped chocolate. Tasks were separated and specialized like this to create the most efficient production process possible. In 1903, Milton S. Hershey founded a chocolate company that would be known for employing these principles from the Industrial Revolution. Hershey’s Kisses offered a consistently identical product that could be efficiently mass produced. Customers were guaranteed that when they unwrapped the foil, they would be met with a tasty milky chocolate that would satisfy the customer every time. These principles put in place by Hershey showed the beginnings of the chocolate industry as we know it as today. Hershey’s Kisses, wrapped and unwrapped. This except from the popular television show, “I love Lucy” also shows that chocolate has played a role in the culture of our society. While the video makes most viewers laugh at the small expense of manufacturing companies, its true purpose is to promote chocolate. Richard Cadbury revolutionized the chocolate industry with his chocolate’s association with heart boxes and Valentine’s day. In 1859, Cadbury introduced his own brand of chocolate, and over the next decade he began to package his chocolate into heart shaped boxes. Heart shaped boxes were previously used for betrothal jewelry, sewing materials, and porcelain. By filling these boxes with his chocolate and associating them with Valentine’s Day, Cadbury had struck cacao gold. Sales skyrocketed because of the already present reputation of chocolate as being more feminine, an aphrodisiac, and a token of love. Over a hundred and fifty years later and chocolates are still associated with Valentine’s Day, are still gifted to women, and still presented in heart shaped boxes. In conclusion, the Industrial Revolution made chocolate accessible to more than just the elite and rich of Europe and America. Inventions during the Revolution increased the efficiency of producing chocolate as both a drink and a solid, while the assembly line further increased the mass production of identical products. Without the Industrial Revolution, we would not experience the same chocolate industry that we have today. Coe, S.D. & Coe, M.D. The True History of Chocolate. New York: Thames and Hudson, 1996. Print. Goody, Jack. “Industrial Food: Towards the Development of a World Cuisine.” 2013. McClements, D. Julian. Understanding and Controlling the Microstructure of Complex Foods. Woodhead Publishing 2007, 654. Quélus, D, & Brookes, R. The Natural History of Chocolate: The second ed., Printed for J. Roberts, near the Oxford-Arms in Warwick-Lane. The History of Chocolate: A Story of Mass Democracy or Mass Exploitation? A traditional view of the history of chocolate focuses on the growth in mass consumption of chocolate as a byproduct of democratization and the industrial revolution. With time, consumption of chocolate spread from Aztec elites to the European nobility to the common citizens of the Western world. However, I contend that the history of chocolate is not simply one of expanded access fueled by increased political and economic inclusiveness, but rather one of shifting patterns of exploitation. The expansion of chocolate consumption has tracked the political enfranchisement and growth in economic power of white Westerners, but has simultaneously resulted in the brutal exploitation of poor brown and black people, first in Latin America, and now in Africa. In ancient Aztec society, the consumption of chocolate was confined to the elites, which included members of the royal house, lords and nobility, long-distance merchants and warriors. Consumed after dinner at royal banquets, it was considered an exotic delicacy and a gift from the gods, a precious treasure not to be wasted on commoners (Coe and Coe, pg. 95). It was also used in religious ceremonies, including marriage rites, to symbolize the sacred nature of matrimonial covenants (Coe and Coe, pgs. 97-101). When the Conquistadors brought chocolate back to the Old World from Mesoamerica, it quickly spread through Europe, becoming a delicious treat for European nobles. Through the displays and pageants of Spain’s Habsburg rulers, the drink quickly gained fame, with powerful oligarchs such as Cosimo de’ Medici becoming “chocoholics” (Coe and Coe, pg. 135). Curiously, chocolate came to be seen as more feminine, as it was popularized with ladies of the royal courts in Europe. It retained its association with marriage, as women intermarried among royal families and brought their love of chocolate with them (Coe and Coe, pgs. 136-137). Despite chocolate’s elite origins, a different narrative took form around chocolate as production methods were refined and it became more broadly available to the masses. By the late 17th century in England, chocolate became associated with the intellectual movement towards democratic governance during the Enlightenment era. Chocolate houses and coffee houses became centers of democratic thought, prompting Charles II to issue an ultimately futile decree to close them down in 1675 (Coe and Coe, pg. 168). Chocolate was truly democratized in the mid-19th century, as technological innovation during the Industrial Revolution made chocolate far more accessible to ordinary people. In 1828, Coenraad Johannes Van Houten invented the alkalizing process which gave chocolate its familiar dark color and made it milder in flavor. In 1849, Joseph Fry invented the modern chocolate bar, using cocoa butter to transform chocolate into a solid confection (Coe and Coe, pgs. 234 – 241). Simultaneously, sugar, which had come into common usage as both a preservative and an ingredient to supplement the caloric needs of working and middle class citizens in the West, came to be one of the most important components of both chocolate drink and the newly invented bars (Schartzkopf and Sampeck). As the narrative goes, the physical transformation of chocolate represented a revolution in accessibility, carried on a wave of political democratization and the industrialization-fueled growth in mass consumption. Though the history of the spread of chocolate is often portrayed as a triumph of mass democracy, in truth chocolate has been and continues to be a product of extremely unequal, hierarchical systems of racial and class-based oppression, in which poor brown and black people produce chocolate as a luxury good to be enjoyed by better off, mostly white Westerners. The oppressive hierarchies of Western chocolate production trace their origins to the encomienda system of the early 16th century, in which Spanish colonizers virtually enslaved the Native people of their American colonies, forcing them to harvest cash crops such as chocolate beans, often at the expense of their own lives (Yeager). Eventually, the encomienda system came to an end, and chocolate production in the New World gradually became the domain of newly enslaved Africans. As globalization increased, and outright slavery fell out of favor, production shifted from Latin America to Africa, with (technically illegal) slave labor still being used to produce chocolate in places such as Sao Tome as late as the early 20th century (Satre). In the modern era, the exploitation of African labor continues. 74% of chocolate was produced in Africa during the 2016-2017 season, but Africans only consumed a tiny percentage of the chocolate they produced, and received a comparatively small cut of the profits (Leissle, pgs. 4-7, 36-46). In the words of Ghanian farmer Mercy Asabea, when asked about the local scarcity of chocolate, “Ghana made Europe what it is…We have every resource here, yet Ghanians are not progressing at all” (Leissle, pg. 57). “Bars of Black Swiss Chocolate.” Wikimedia Commons, 8 Oct. 2015, commons.wikimedia.org/wiki/File:Dark_chocolate_bar.jpg. Boucher, Francois. “The Afternoon Meal.” Wikimedia Commons, 10 Aug. 2017, commons.wikimedia.org/wiki/File:Fran%C3%A7ois_Boucher_002.jpg. Schwartzkopf, Stacey, and Kathryn E. Sampeck. “Translating Tastes: A Cartography of Chocolate Colonialism.” Substance and Seduction: Ingested Commodities in Early Modern Mesoamerica, by Stacey Schwartzkopf and Kathryn E. Sampeck, University of Texas Press, 2017, pp. 73–99. Stolen Lives Project. Chocolate Slaves. Vimeo, 2 Aug. 2015, vimeo.com/135172005. Wade, Kristine. “The Production of Chocolate.” Flickr, 3 Feb. 2017, http://www.flickr.com/photos/147998004@N06/32640931946. Yeager, Timothy J. “Encomienda or Slavery? The Spanish Crown’s Choice of Labor Organization in Sixteenth-Century Spanish America.” The Journal of Economic History, vol. 55, no. 04, 1995, pp. 842–859., doi:10.1017/s0022050700042182.